Last week we looked at how cities like my hometown of Brainerd, MN have invested millions of dollars trying to retrofit their traditional development pattern - a pattern that was originally a collection of walkable neighborhoods - to an auto-oriented development model. We examined not only the massive expense this created, both in the initial investment and in the ongoing maintenance, but also how this shift to an auto-centric pattern has driven commercial investment out of these neighborhoods to regional strip malls and big box centers (which, incidentally, are located in a neighboring community). Before we discuss a new set of Strong Town values that need to be applied for the future of these places, it is important that we first examine the residential components of the traditional development pattern. For this I am going to start with one house, a house that struck me as being a decent representation of the home that people would look down their nose at as they pined for this neighborhood to redevelop. Instead of being an eyesore though, this house actually personifies the best hope for this neighborhood and the thousands like them across the nation. 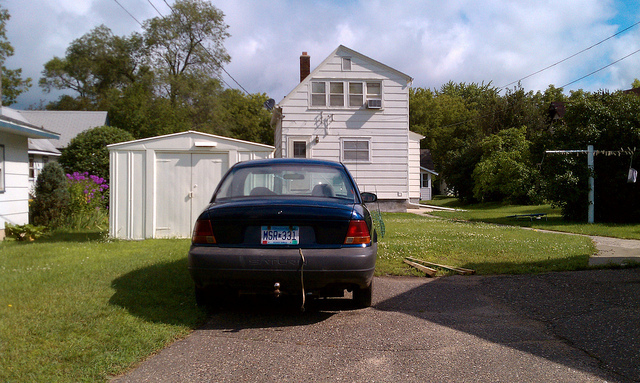 This house is "old" Brainerd, the part it is trying to rid itself of with all this investment in wider streets. It is a small house that, if you look closely at this photo and the one later on that shows the rear of the building, was at one point even smaller (there have likely been at least two additions). Here are some things to note about this house. First and foremost is the way it addresses the public realm with a big window and a front door. It is telling the world, "People live here." While the window is boarded up now (probably to help that cheap window AC unit do its job), when this neighborhood used to be vibrant that window was part of the Jane Jacob's model of community self-policing (the eyes on the street). The front window communicates to people walking through here that they belong and that they do not have to compete with cars in this space. There are some other subtle features that make this house friendly to the public realm. It is articulated to face the street with the crown of the roof running perpendicular to the public space. The sidewalk is positioned to provide room for some modest front yard landscaping (which would be more prevalent if the streets were walkable and people actually inhabited these spaces, not just cars). There is also a boulevard for shade trees along the street. Also notice that, besides the TV dish on the roof, there are no TV pedestals, electric boxes, cleanout pipes or any of the other grunge we have come to tolerate in the modern public realm. That stuff you will find in the alley behind the house. An alley is an amazing, but simple, concept. We put the disgusting stuff that we don't want to interact with behind the house in the alley. That allows us to preserve the public realm in front of the house as a tranquil, friendly, inviting space that, when done right, becomes an extension of the living room. At least that is how it was designed to work. In this alley you will still find all of the utilities we'd rather not see along with garbage collection and, take note, cars. This is where cars are stored in a traditional neighborhood (except for guests - we want them to park in front and experience the beauty of the neighborhood upon their arrival). In the backyard there is not only storage but also a lawn and even a clothes line. This is private space - a little disheveled, but not in a way that impacts the overall look and feel of the neighborhood. Notice also in the back how the architecture gets a little awkward with the rear addition being wider than the front and asymmetrical as well. While I would have hoped it had been built differently, that funkiness matters little in the rear. You can tell that, while this house may have - as a realtor would say - "potential", it suffers from neglect. This is a consistent pattern you see throughout this neighborhood. This is a small home. The value of this home is not in the structure itself or the location but in the neighborhood. If two homes were of equal value, one in this location and one two miles out of town on a lot four times as big, the only reason you would choose this home would be because it is in a neighborhood that provides things of value. Parks, shops, gathering places, schools, jobs, etc... A public realm that is walkable and inviting. These are the things that used to give this home value (and could again). When the streets in front of this house and the others in this neighborhood were converted from a walkable, neighborhood-oriented design to wide, auto-centric thoroughfares, not only did the city spend a fortune, but they massively devalued these homes in the process. The neglect apparent in these neighborhoods is a direct result of the misapplication of suburban development standards to the traditional framework. Southeast Brainerd has some of the lowest valued neighborhoods in the entire area (and ironically, some of the most expensive and extensive infrastructure investments). Since anyone living here (or two miles out of town) has to drive everywhere for everything, the competitive advantage of these neighborhoods is lost. One might as well live two miles out of town on some acreage - if you have the means - than move into a neighborhood in decline, where the schools are closing, the businesses have been forced out and you can't let the kids play in the street, or even walk to the park, because the cars drive too fast. Either locations forces a drive of five or ten minutes to get everywhere you are going anyway! When you are forced to drive everywhere, when the public realm is taken away from people and given over to cars, traditional neighborhoods lose their charm. In an auto-dominated mindset, these places do not fare well. They quickly become economically uncompetitive. Subsequently, these neighborhoods do not create anything near the tax value necessary to cover the ongoing maintenance costs they require. Cities that have gone down this route can never build enough new, shiny stuff on the periphery to make up for the revenue gap they have created in their old, traditional neighborhoods. That does not mean these places are void of new investment. Wednesday we'll examine the types of investments that neighborhoods like this actually get in their new, auto-centric form. Want to bring the Strong Towns team to your community to talk about the Strong Towns movement with public officials and local leaders? Sign up for a Curbside Chat, our initiative to bring the Strong Towns message to towns and neighborhoods across America. You can also join us on Facebook and Twitter.